Paper: Kuretake, Kaiser, K & Co. 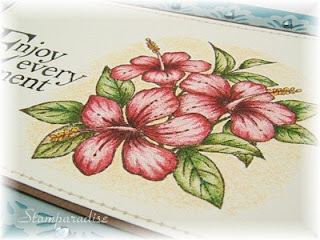 This card is for The Pink Elephant Challene #25 which is sketch challenge. The size of this card is 10.5 × 10.5cm (approximately 4.1 × 4.1 in.). 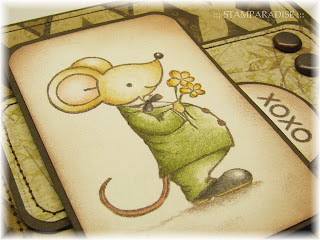 When my son saw this card in this morning, he said "Is this mouse pregnant?" Oh boy...this mouse is a boy. lol! Hello Everyone!! I can't believe that it is already Wednesday. I always think that what I'm able to do in a day is less than other people... I wish there were 27 hours a day. lol!! 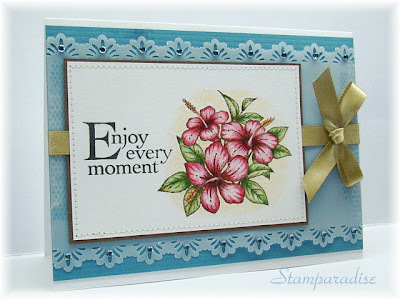 I carved a clematis stamp, and made this card with that. I used the sketch this weeks Our Creative Corner has provided. The image was colored with Holbein Colored Pencils and Meltz pen as usual. I put a gold satin ribbon on a lace to make 3 right lines, and added some pearls.The sentiment was stamped with Eggplant ink(Versa Magic) to fit the color of the clematis. This card is my entry for Mojo Monday Week 96. The floral image were stamped 3 times with using masking technique, and were colored with Holbein Artist Colored Pencils and Meltz Pen. 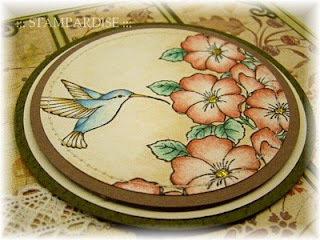 I added the hummingbird, and colored it with mixture of Holbein Artist Colored Pencils and Distress Ink. 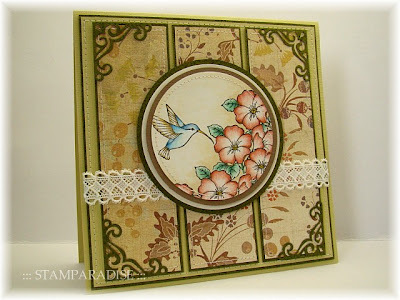 I love the 7gypsies paper I've used on back panels! It's very beautiful, isn't it? The day before yesterday, I received the telephone call from the PC store I commissioned to fix my PC. The computer virus had been removed, but there was trouble of a keyboard, and they said it was out of hand. They said that they would send my PC to the manufacturer, and it would take more than 2 weeks before it was fixed. Oh my... I have to borrow my husband's laptop computer to write a blog for a while. Now, let's go on today's card! I made this card for my little sister who is going to have a new baby at the beginning of August. I used 3 kinds of chick stamps. I stamped them with using masking technique. After I colored them with Holbein Artist Colored Pencils, only the central chick was layered. 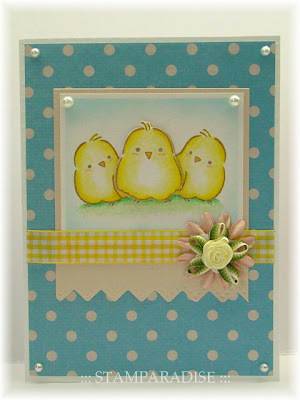 I'm entering this card to this weeks Creative Card Crew Chalenge as their theme is "Polkadots". I hope that my sister give birth to a fine baby safely. And I'm looking forward to seeing her baby!! Hello everyone~! I apologize for my long absence. My computer has not been repaired yet. The trouble is much severer than I was thinking...:( But my husband has lent me his laptop computer today, so I can show you 2 summer cards. 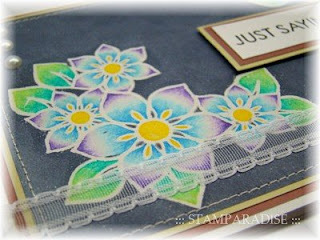 I took my inspiration for this card from one of the designs of yukata. I used Batik technique for this card. 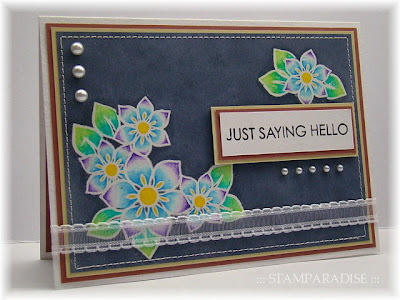 At first, I stamped floral and leaf stamps with Versa Mark ink by using masking technique, and heat embossed them with clear embossing powder. After I coloerd the image with Holbein Artist Colored Pencils, I coloerd them again with Versa Marker and heat embossed. Then I sponged yozora ink for the background. 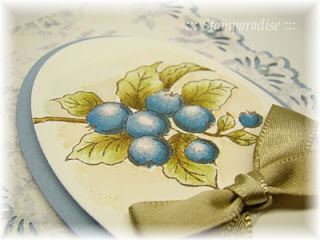 At last, I re-melted embossing powder by using an iron. It took a lot of time to make this card, but I'm very satisfied with the finish. This card is very simple compared with the 1st one. lol! 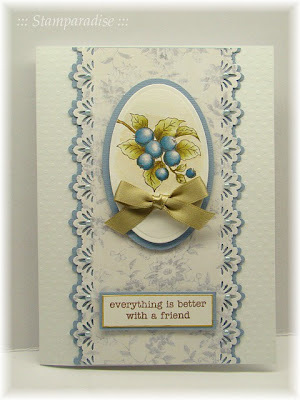 All things I did to make this card were stamping, coloring, and adding some embelishments!! 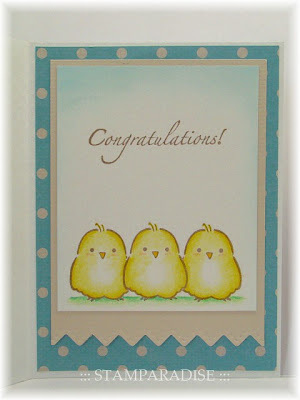 I'm entering this card to Colour Create #23(Blue & White). 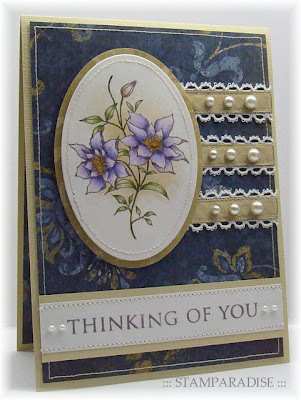 Today's quick post is the card I made for FTTC #23. The challenge is to cut the image out and pop it up. 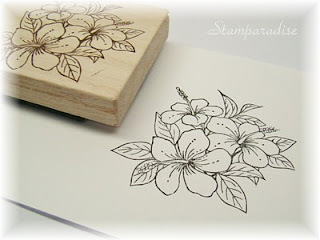 I used my Hibiscus stamp again. 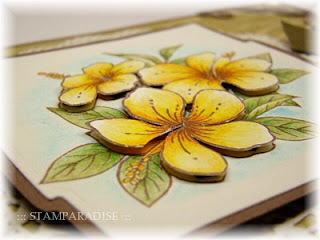 This time, the floral parts were colored with yellow shades. I cut them out with scissors and layered. Well, My computer is not working well.... My husband guesses that it has been infected with a virus. So I've decided to have my computer repaired. I'll be absent from blogging for about 1 week. Please don't forget me~! Tank you for looking! Have a wonderful weekend！ See you soon!! 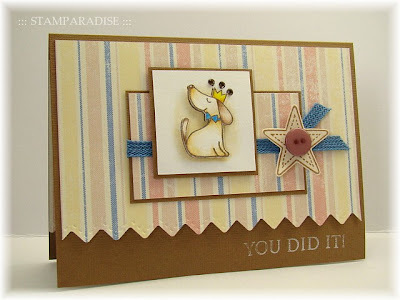 This card is for TPE Challenge #22(Stars and Stripes).The dog image was colored with Holbein Artist Colored Pencils and Distress Inks, and was layered. The star was stamped with Gingerbread ink(Versa Magic) on a scrap of beige cardstock, and was cut out. 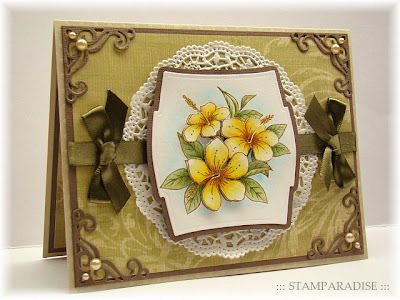 I'm entering this card to this weeks Creative Inspirations challenge. Their theme is to use Gems and/or Pearls on our creation, and I've added three gems on the top of the crown. I carved this stamp a few days ago, but I had no time to make a card using this stamp till yesterday. And I managed to make a quick card today. Hum....., does the image look like a hibiscus? I'm not satisfied with my coloring. I wanted to get bright and cheerful impression, but I couldn't. It looks acrid, doesn't it? :( I would like to try again with different color someday. 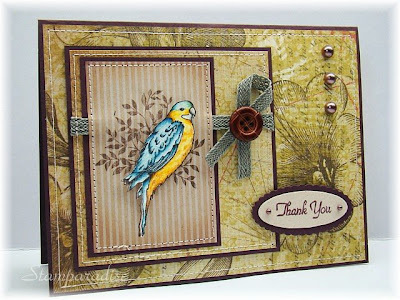 I made this card for Mojo Monday #93 and Stamp with Stampavie #50(The theme is "birds"). 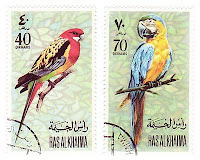 The stamp I've used is the same one I had used on this card. I stamped it with Espresso ink on mini stripe paper, and also stamped with Real Black ink on white paper. 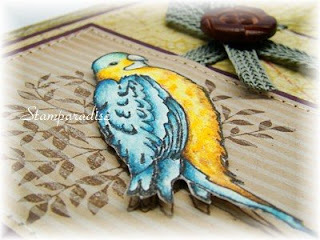 I coloured the bird on white paper with Holbein Artist Coloured Pencils and Meltz Pen, cut it out and layered. The edge of main panel was sponged with Cocoa ink. Top 5 at TPE challenge #20! I was very surprised last night. 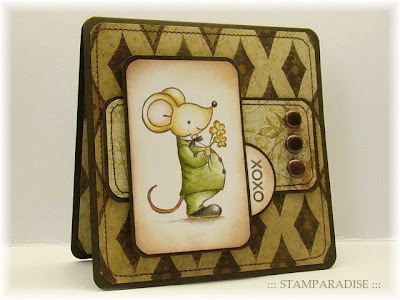 Because...this card has been chosen as one of the top 5 at The Pink Elephant Challenge #20! I'm sooo happy! :) Thank you!! !